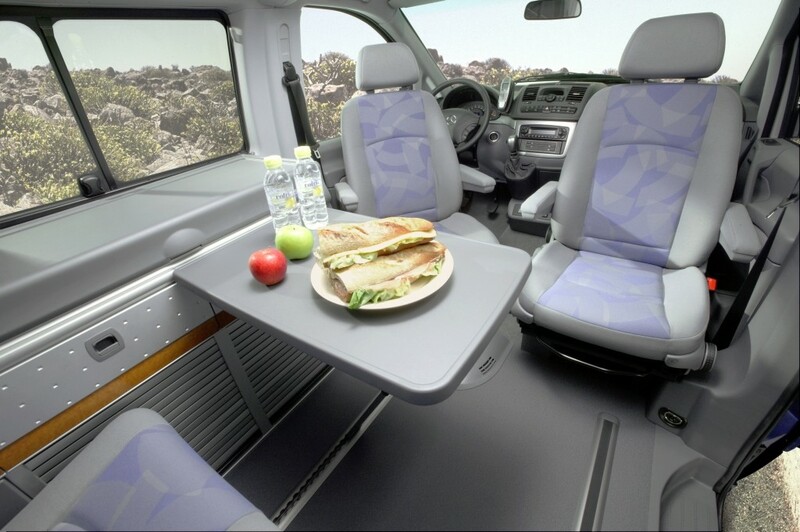 Mercedes-Benz has put its own uniquely luxurious twist on the world of the grimy and grubby campervan – say hello to the gorgeously upmarket Marco Polo. Clearly looking to usher out the Volkswagen California in its native Germany, the new Merc camper really is a tale of wall to wall refinement inside and out. The folks at Mercedes teamed up with Westfalia to go about giving a regular V-Class a pretty sizeable makeover – the results of which were debuted this week. Complete with retractable table, wardrobe, kitchenette and enough room to comfortably sleep four, the Marco Polo means business in practicality stakes. LED lighting has been used strategically throughout the interior to bring a luxurious look and feel to the Lugano leather upholstery and black seat trims. The kitchen sink is complimented by two hobs, an extendable counter top and a refrigerator, not to mention more storage space than your average home on four wheels. The lower bed (aka the flattened rear seats) is right on the borderline between nicely cozy and too small, while the upper mattress offers a little more room for maneuver and even a safety net for any kids that decide to fall off it in the middle of the night. Even the curtains look the part and manage to do an unusually good job of blocking out even the brightest of light, while the tinted windows will keep you and your from being peered at while relaxing day or night. And if that wasn’t enough, early reports on the Marco Polo suggest it’s every bit as luxurious and comfortable to drive as it is to catch some Zs in. As for when or if we’ll see the Marco Polo in the US, chances are it’ll come down to how well it performs in Germany and whether there’s sufficient demand to send a bunch overseas. If it doesn’t you can expect to pay in the region of $75,000 for the privilege, which isn’t that bad considering it’s nicer on the inside than the average condo.